An early concept sketch of U.S. Rep. John Larson’s proposal to bury I-91 and I-84 underground in Hartford and East Hartford. The proposed tunnels are shown in yellow and the existing highways in blue. The cloverleaf intersection would be under Colt Park. Now that Democrats have taken control of the U.S. House of Representatives, Larson envisions a path forward. He said in a recent interview that he expects his party to bring out an infrastructure bill in the Spring, the first in eight years. As a member of the Ways and Means committee, Larson believes he is well positioned to bring some of the infrastructure spending to Connecticut. The tunnel story starts with efforts to replace the 2.5 mile series of viaducts that carry I-84 through much of Hartford. About 80 percent of the 1960s-era roadway was built on bridge stanchions that are now past their projected 50-year lifespan. Early in the last decade the DOT considered repairing the viaduct in place. But a citizens group, the Hub of Hartford, formed and urged a different solution, one that would undo some of the damage the highway had done to the city. The city, regional planners and eventually the DOT got behind the idea. Maintenance repairs were done — and continue — on the viaducts, but in 2012 the department also initiated a widely praised public planning process. After looking at several options, the planners determined in 2017 that a highway at or slightly below grade was the best way to replace the viaduct system. It would, for example, allow city streets to cross over the roadway, diminishing the walling effect of the elevated highway. This plan is moving ahead. The original highway was built on bridges in part to accommodate the railroad. The first step in bringing the highway to ground is to relocate some of the tracks and build a new station. Planning has started, and construction is a decade or more away. But replacing the highway doesn’t by itself improve worsening congestion. I-84 was built to carry 55,000 cars a day through Hartford; it now carries 175,000. In addition, I-84 shrinks from three lanes to two in both directions around the Bulkeley Bridge, constricting rush-hour traffic. Another 100,000 vehicles traverse I-91 each day. The I-84/I-91 interchange, with 275,000 cars a day, is the worst bottleneck in the state, the second worst in New England and the 24th worst in the country, according to the American Transportation Research Institute. Well aware of the problem, DOT Commissioner James Redeker in 2016 initiated a study of the I-84/I-91 interchange. 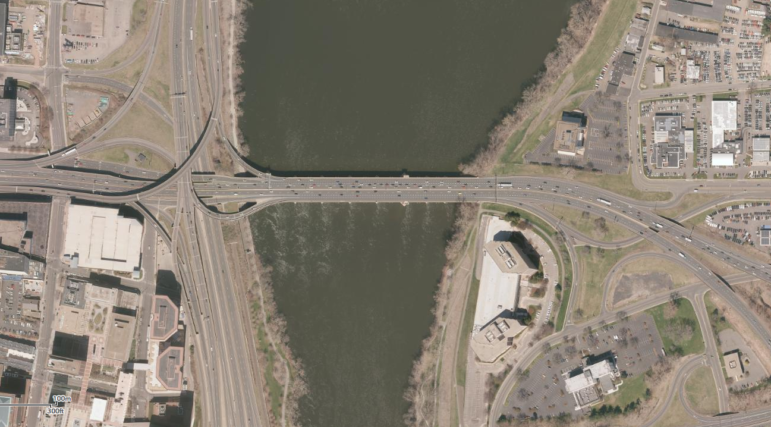 The study began by focusing on three long-term options to reduce congestion: widening the historic stone-arch Bulkeley Bridge, moving the I-91/I-84 interchange north of downtown and building a new bridge over the Connecticut River, and running a highway across the southern tier of the city to connect with the Charter Oak Bridge. At this point, in the winter of 2016-2017, seemingly out of left field, came the congressman with his tunnel concept. Aerial photograph of Hartford from the 2016 National Agriculture Imagery Program. Larson, who was easily re-elected to an 11th term last week, pays close attention to infrastructure issues. He has been trying for years to get federal funds to repair the flood control system along the Connecticut River. All applaud this effort; the 1940s system of dikes, pumping stations and conduits is in an “unacceptable” state of repair, according to a 2013 inspection by the U.S. Army Corps of Engineers. Should the levees fail, Hartford could suffer a Katrina-like catastrophe. By comparison, the Big Dig’s Thomas P. O’Neill (Central Artery) and Ted Williams tunnels are 3.5 and 1.5 miles long, respectively. The solution the DOT planners most prefer is the so-called “northern alignment,” which would move the I-84/I-91 interchange to the city’s North Meadows. There would be a new connector from I-84 along the railroad right-of way through the Clay Hill neighborhood to the Meadows — a mecca of car dealerships — then over a new bridge and onto a state-owned right-of-way in East Hartford that would connect it back to I-84. In essence, through traffic would circumvent downtown while local traffic would be accommodated downtown. The roadway would be capped where it traverses residential neighborhoods. Neighborhood opposition might be an issue, though preliminary feedback indicated many residents liked the idea of better access to the highway. Redeker said the northern alignment would free up 150 acres of land in Hartford and 50 acres in East Hartford for development. The tunnel would presumably do the same. Finally, there is the issue of cost. DOT officials estimate that the full tunnel system could cost as much as $50 billion. Larson said that figure is “ridiculous,” and when he announced the concept he estimated the cost at $10 – $12 billion. At this point these are guesses; the project has not been penciled out. The reason for the wide discrepancy in cost estimates is apparently because Larson’s original proposal envisioned one tunnel in each corridor, probably with two tiers. The DOT planners think traffic volumes would require two adjacent tunnels in each main corridor, one in each direction, plus the interchange, or up to 18 miles of tunnels. The interchange tunnels would each have one lane, and the I-84 and I-91 mainline tunnels would have two tiers with two lanes on each tier, thus up to 54 lane miles. Using Seattle’s cost of $0.47 billion per lane mile, this translates to$25.38 billion in 2015 dollars for the Hartford project. Add a 3.5 percent cost escalation factor each year for 15 years and the cost rises to about $50 billion. Larson said he would not propose something that expensive. Seattle’s tunnel of just under two miles cost $3.2 billion (and will be paid for in part with tolls). Larson said any solution will be expensive; the DOT agrees but says the tunnel will be far and away the most expensive. So how is this (highly preliminary) dilemma resolved? They also agree that it is vitally important, as Larson said, to “get it right this time. Meanwhile, he said, there are plenty of other important transportation infrastructure projects awaiting funding.